There are over 1250 species of bats in the world, and about 80 here in Australia. The vast majority, about 1000 and 70 respectively, are echolocating microbats that mostly eat insects. The rest are fruit and blossom-eating megabats of which flying foxes are the largest. The smallest microbat in the world weighs 2 grams, and the smallest megabat is 12 grams. Not a lot of difference really so the words micro and mega can be quite misleading. Together they represent a quarter of all mammal species on this planet. All bats have eyes, and good vision, so best to use the German saying ‘as blind as a mole’. There has been an avalanche of community conflict around flying foxes in Queensland over the last few years. This has been accelerated by medieval myths that have proved highly resistant to rational discussion. Do not touch bats and your risk is zero, if you are accidently bitten or scratched follow medical advice. Myth number two is they exist in plague proportions. 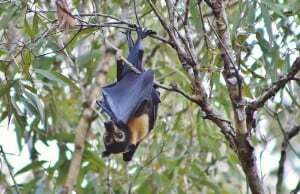 Two of Australia’s four species of flying fox are listed as vulnerable to extinction, and there is no population data for the other two species. Flying fox females are pregnant for six months, giving birth to one live young which they then breast feed for six months. Sexual maturity is reached at three years and the average lifespan in the wild is eight years. This means they are lucky to have five young in their lifetime, many of whom will die in the first year or else fall victim to heatwaves, barbed wire fences, shooting or backyard fruit netting. 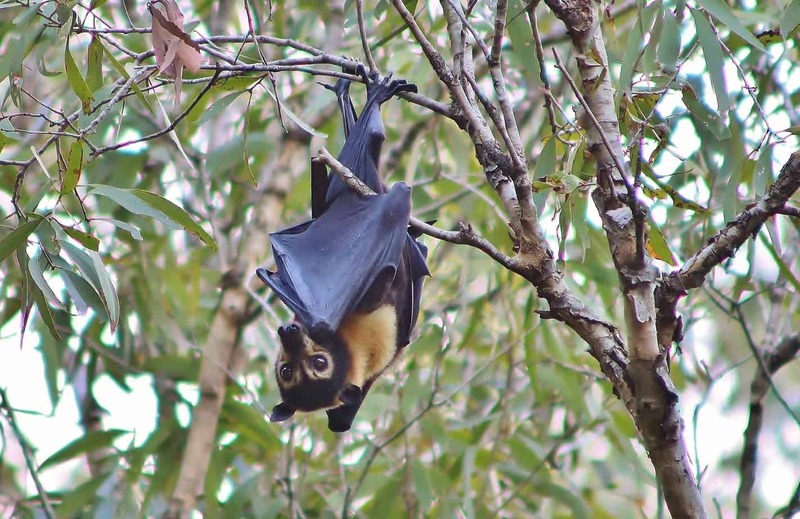 Flying foxes cannot physiologically breed into plague proportions. Myth number three is that they depend on fruit orchards. Flying foxes are fruit and blossom bats. Their favourite food is nectar from the Myrtacae family –eucalypts, paperbarks etc. Ever wondered how huge numbers of Little Red flying foxes can just turn up, as they have in Herberton for the last three months, and feed themselves every night? There has been a huge flowering of various eucalypt species. Not an orchard in sight. Yes some species of flying fox will raid orchards, and most farmers have an effective means of protection in the form of netting. The pollination and seed dispersal services provided by flying foxes are essential for healthy forests. The Cairns City Council is looking to try to move the flying foxes near the library in the next few months. The community is divided over this issue. Yes there is noise and smell, but neither is necessarily problematic. The disease risk will get rolled out and unfortunately ignore the scientific consensus about health risks from bats will be ignored.